The system instituted by Lycurgus proved remarkably successful for centuries. The organization and training of the—at their height—around 8,000 Spartan citizen-soldiers to suppress the Helots also translated into international military power, which in turn allowed Sparta to secure allies and thus yet more military power in the Peloponnese. Xenophon opens his account of the Spartan regime saying: “Sparta, despite having one of the lowest populations, had nonetheless clearly become the most powerful and most famous state in Greece.” The unsentimental Thucydides says of Sparta: ‟its system of good order is very ancient and it has never been subject to tyrants. The Spartan constitution has remained unchanged for somewhat over 400 years . . . a source of strength, enabling their political intervention in other states” (Thu., 1.18). Indeed, Sparta was hailed for her lack of civil wars among citizens, a common cause of grief in the Greek world, and for having intervened to liberate other Greek cities from tyrants. Sparta’s oligarchic government seems to have been better than Athens at securing consenting allies among fellow-Greek city-states. The Spartans seem to have been better able at developing stable interpersonal ties with foreign elites, whereas the Athenian democracy tended to a chauvinism serving her own citizens alone without regard for its imperial subjects. 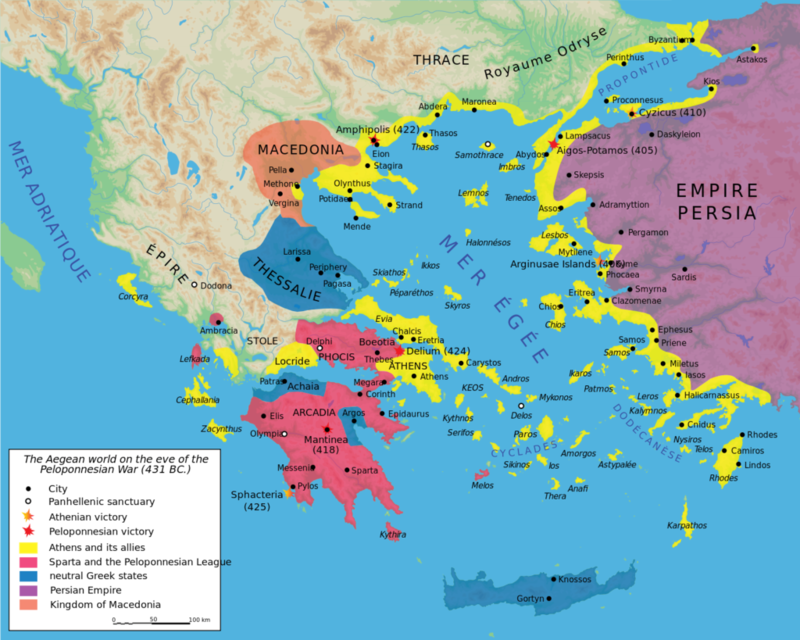 Thucydides has Pericles boast that Athens did not use undependable foreign allies in war but only Athenian residents, implying that Sparta in contrast had the assistance more-or-less consenting allies. The great successes of Spartan social organization came at a heavy price. The city was devoid of material culture, leaving precious few artifacts in the archaeological record. Even during its heyday, Thucydides observed that Spartan architecture was so unimpressive in comparison with Athens, that “if the city of Sparta were to become deserted, with only the temples and the foundations of buildings left to view, I imagine that with the passage of time future generations would find it very hard to credit its reputed power (Thu., 1.10). Alexander Hamilton wrote that “Sparta was little better than a well-regulated camp.” Sparta is unlikely to have had much intellectual culture either. If there were any Spartan dramatists and philosophers, there is virtually nothing that survives of them. There is little to suggest there was any Spartan equivalent of Athens’ extraordinary theatrical and philosophical achievement, notwithstanding the idealizations and ironic paradoxes of the philosophers. Indeed, the Spartans were said to be “the least intellectual of men” (Aristotle, Rhetoric, 1398b). Sparta was basically a caste society. Besides the solidary elite citizen body of Spartiates, there were also “fallen” Spartans who had lost their citizenship for reasons of poverty or dishonor, “neo-citizens” who had been naturalized (especially in the later years) to have more soldiers, the working Peripherals who gravitating around the city, and finally the Helots. This appears to have been, somewhat like ancient and medieval India, a largely static society. It was certainly a closed society in which, besides the rigid social order, foreigners were restricted from entry and regularly evicted to prevent the Spartans from being infected with foreign cultural influence. Furthermore, it appears that Sparta’s power in the Peloponnese was based on its ability to retard urban development abroad: rival cities were broken up into villages and placed under the government of Spartan-friendly landowners. Sparta has an air of stagnation, and while the appearance of eternity typically impressed the Ancients, we Moderns tend to feel that that which does not grow is already doomed. At the same time, living in a time of perpetual economic growth leading to cultural collapse and ecological exhaustion, the Spartan ideal and long-lasting success of a socio-political steady-state perhaps has a new relevance for our time. By the yardstick of individual freedom, the ledger is perhaps not quite as much in Athens’ favor as one might expect. In every premodern economy, the precious leisure necessary for culture and civic life is necessarily the purview of a select few. Athens no doubt afforded more scope for individual merit, freedom, and political participation to a greater share of the population on the whole. But one also should not forget that democratic Athens itself was based on chattel slavery, subject colonies, and house-bound women. In the Spartan empire, notwithstanding the hard lives of the Helots, women and allied states were generally freer than those of Athens. Furthermore, those who have tasted the monastic life may also suspect that the highly-regimented Spartan lifestyle—the constant training in community life, athletics, and self-restraint—may have offered citizens certain deep satisfactions not available with the liberal lifestyle. It would appear that the system devised by the Israelite lawgiver [Moses] was in some sense a better strategy for maintaining long-term ethnic coherence than that designed by the Spartan lawgiver, since the Israelite strategy, arguably, continues today (see [The Culture of Critique], ch. 8). The Spartan system was an excellent defensive system, but was ill equipped to administer an empire, and there were no provisions, such as the hereditary Israelite priestly class, that would have allowed it to survive being militarily conquered – a contingency that was all but inevitable in the ancient world and that certainly continues to some extent today. For MacDonald, “while the group strategy of the ancient Spartans was successful for a significant period, it was ultimately a failure.” In marked contrast with the Jews, who were able to survive through fanatical adherence to a dogmatic ethnocentric religion, the Spartans proved completely incapable of maintaining their identity and group evolutionary strategy in the absence of a supportive sovereign State. In this, the Spartans were sadly typical of Western peoples. There is furthermore little reason to believe that Sparta’s primitive eugenic measures had much positive effect. There is no doubt that there is a tendency to “slouching” in human history: every new generation balks at the unexplained disciplines and traditional rigors inherited from the past. If this rebelling against the past is done for the sake of comfort and pleasure, as opposed to replacing a tradition with new practices because they are more conducive to the public good, we call this decadence. In Sparta alone, the citizens were able to maintain a fearsome degree of virtue, by the authority held by the elders, by the systematic education and training of the citizens, and by the threat posed by the Helots. The constitution of Lycurgus – with its stability, mixing of elitism and democracy, sovereignty, lawfulness, training, social unity, and sacrifice for the common good – may serve a model for all nations that truly wish to fight to determine their own destiny and adhere to values. The example of Sparta, like Prussia in the modern era, also shows that smallness is no reason for defeatism, that all nations have, with effort, a chance at achieving freedom and greatness. No wonder that the law of Lycurgus and the sacrifice of Leonidas’ 300 Spartans have inspired philosophers and statesmen throughout the ages, even in the face of terrible odds. Given the challenges facing Western and European nations in the twenty-first century – consider the sheer scale of the rising foreign superpowers, ecological threats, and demographic collapse – the Spartan experience in building a lawful, holistic, and biopolitical martial republic may yet help inspire our renewal. Aristotle (trans. H. C. Lawson-Tancred), The Art of Rhetoric (London: Penguin, 1991). Cartledge, Paul, Sparta and Lakonia: A Regional History, 1300 to 362 BC (New York: Routledge, 2002). Herodotus (trans. Robin Waterfield), The Histories (Oxford: Oxford University Press, 1998). MacDonald, Kevin, A People That Shall Dwell Alone: Judaism as a Group Evolutionary Strategy, with Diaspora Peoples (Lincoln, Nebraska: Writers Club, 2002). Plato (ed. John M. Cooper), Complete Works, (Indianapolis, Indian: Hackett, 1997). Plutarch (trans. Richard Talbert and Ian Scott-Kilvert), On Sparta (London: Penguin, 2005), includes Plutarch’s Life of Lycurgus, Sayings of Spartans, and Sayings of Spartan Women, and Xenophon’s Spartan Constitution. Polybius (trans. Robin Waterfield), The Histories (Oxford: Oxford University Press, 2010). Xenophon (trans. Rex Warner), A History of My Times [Hellenica] (London: Penguin, 1979). Thucydides (trans. Martin Hammond), The Peloponnesian War (Oxford: Oxford University Press, 2009). This can be taken as an early argument for sovereign central government rather than divided confederal government. Perhaps the need to convince their allies was partly responsible for the supposed timidity and slowness of Spartan foreign policy (Thu., 8.96). Alexander Hamilton, Federalist No. 6. Lycurgus . . . brought into the light of day, not paper theories, but a functioning constitution which is quite unmatched. To those who suspect that it is impracticable for a theoretical structure to be centered upon a Sage, he has exhibited his whole city practicing philosophy” (Lycurgus, 31). Such passages in Plutarch must be considered idealizations and inspiring exhortations to political philosophy, rather than realistic history. In his Protagoras, Plato has Socrates ironically claim that “the Spartans have the best education in philosophy and debate” (342e). This is no place for a full commentary on this dialogue. However, given the context, it seems Plato is making a paradoxical and humorous comment praising certain Spartan virtues – namely discretion, Laconic wit, remembrance of wise sayings – as integral to the practice of philosophy. One of the great challenges in studying ancient Greek literature, is determining whether a text is ironic or is making some kind of in-joke. Herodotus, Socrates, Plato, and Xenophon certainly often appealed to ironic humor. Whereas Aristotle is here quoting someone else, he was more generally one of the few ancient philosophers to be broadly critical of Sparta, having come of age after its collapse after the Battle of Leuctra. At the same time, Aristotle did admire the communitarian ambitions of the Spartan educational system.